A tiny FM receiver in a lightweight collar emits an audible signal to tell your cat to turn back if they enter a pre-defined danger zone. If your cat fails to respond, the collar give a harmless little “corrective shock”. 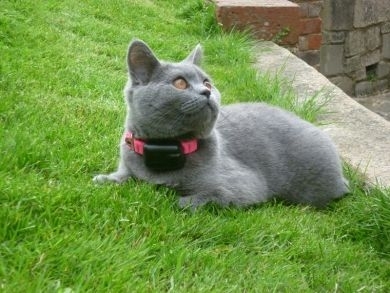 Cats quickly learn to understand what a beep from the collar means, and will immediately turn back into the safe zone. The result is a home or garden with happy, and above all safe cats who play were they are allowed but stay out of areas where they may come to harm. We have a team of professional system installers covering the UK, who will install your Cat fence, and assist you with training your cat to the invisible cat fence. Instructions on self installation of a Dogfence are available.